UPON USING THIS SITE, YOU AGREE TO BE BOUND BY EVERYTHING BELOW. "Etc." implies all items reasonably following the words listed before it. "License" means this agreement, and every word and provision in it. "Noncommercial" uses are those not undertaken for profit or advertising. "Content" means everything on and in the Website (data, text, design, images, etc.). 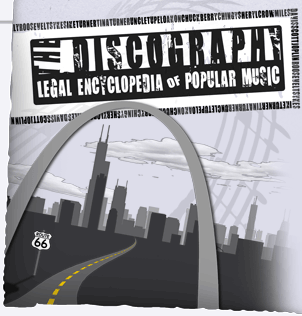 "Website" refers to the web page www.thediscography.org. "Loren" refers to Loren S. Wells, founder of The Discography. "The Discography" means the project as a whole, including Content, Website, Loren, contributors, editors, interns, etc. Intellectual Property- User acknowledges that all Content (past, present, and future) is protected by copyrights, trademarks and any related rights to the fullest extent of the law. The only exceptions under this License regarding User's access to Content are explained generally in § V below. Non-endorsement- The Discography makes no claims of association or endorsement regarding any people or things in the Content; ours is an educational and commentary purpose only. Grant- This License is limited, nonexclusive, royalty-free, and granted to User to use Content according to the conditions in this document. The License begins as soon as User uses the Website, and ends when User breaches License terms or destroys all Content obtained. (Continued use is a continual breach and displays intentionality.) User re-enters this License every time User returns to the Website or uses Content already obtained. This License does not grant any rights regarding third party content, as explained in § V.D below. Reservation of Rights- Unless literally disclaimed in this License, all rights of all kinds arising under any laws covering the Content, Website, and other work products of The Discography are reserved by The Discography. Use of Content- User cannot, under this License and by law, do anything illegal with Content, and if User does, only User is responsible. User agrees to indemnify The Discography, according to § VIII below. Generally- Only "noncommercial" uses of Content are allowed and only according to terms in § V.B below. "Commercial" uses are forbidden (§ V.C.1.a), as is using Content to assemble "collections," "compilations," "assemblages," etc. (§ V.C.1.b) If User is unsure about a specific use, User should contact us and ask to be sure. No actual text or image is copied from The Discography. The Discography is not a significant source used, but one of many. The Discography did not provide the idea for the use, and the idea was not derived from Content in any way. Content is not used in anything commercially available, even if for nonprofit purposes. Actual text is copied from The Discography. The Discography is a significant source consulted. The Discography provided the idea for the use, or the idea was derived from Content in any way. Content is used for news/opinion purposes in commercial publications like periodicals, books, documentaries, web publications, etc. Websites put The Discography's logo, name, banner, etc. ("Identifiers") prominently alongside or inside User's use of the Content. Newspapers/Magazines put Identifiers in text, credits, captions. Reports put Identifiers within the text or works cited list. "Commercial uses," like subscription services, physical products, licenses, information services, advertisements, professional services, etc. "Collections," "compilations," or other "assemblages": like encyclopedias, databases, lists, casebooks, etc., in any form now or hereafter known. Illustrations, Trademarks, and Designs- Everything that looks trademark-able or copyright-able on the Website (like the "Guitar of Justice," blog cartoons, design, etc.) can not be used, except with proper License Modification (§ IX.C) from Loren. Catch-All- Any use of Content not explicitly described in § V.B above is not permitted. The preceding sections (§ V.C,1-2) describe anticipated nonpermitted uses, but are not exclusive and do not limit expansive language elsewhere in this document. Outside Information- This License only covers Content originated by The Discography; if User wants to use third-party content (like CelebrityAccess's News or CERL's logo), User needs their permission. No sub-licenses/Assignments- User has no rights to assign or license rights under this License to any person or entity. Accuracy and Guarantees- There are no guarantees. The Discography makes no representations, covenants or warranties (expressly or impliedly) about anything on this site working or remaining accessible, and makes no representations about the accuracy of any Content. If User gets sued for anything they do with Content, it is their problem and legal responsibility, even if the problem originated with The Discography. Limitation on Liability- The Discography is not liable to User for any incidental, consequential, punitive, or exemplary damages arising from this agreement or User's use of the Content, to the fullest extent of the law. Indemnity- User will defend, indemnify, and hold The Discography harmless for all legal actions arising from User's use of the Content, and will reimburse all costs incurred. User will cooperate with The Discography in such cases, and will not settle without permission. Severability- If any part of this License is found invalid in any way, it will be reformed as minimally as possible, and in all cases the rest of the License continues to be valid. Entire Agreement- This License constitutes the entire agreement between User and The Discography. Alterations can only be made according to § IX.C below. Modification of Agreement- Modifying the License is only done by written agreement, titled "Modification of Discography License Agreement," signed by Loren. However, The Discography may update this License at any time. Once posted onto The Discography Website, User is bound by and expected to be familiar with the most up-to-date terms. UPON USING THIS SITE, YOU AGREE TO BE BOUND BY EVERYTHING ABOVE.